October is quite possibly one of our favorite months here at Remedi Spa. Along with offering our fall-favorite specialty spa treatments this month, we get to celebrate the spookiest holiday. While many people share in our excitement for fall, this is also a time when the cold, gloomy days set in, which can affect our energy and mood — no matter how hard we try to fight it. But there’s no need to fret! 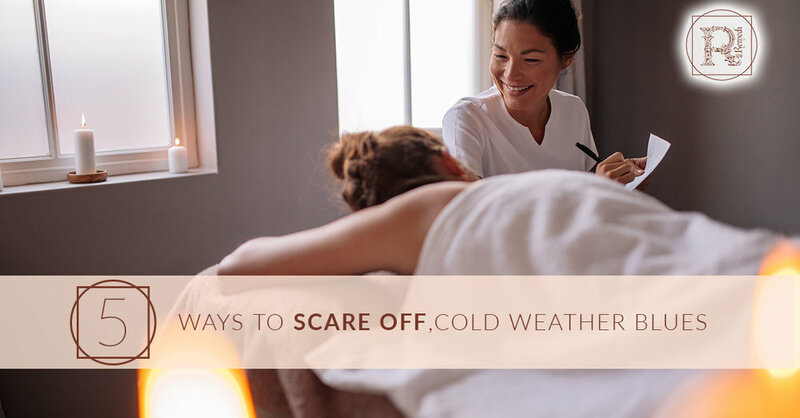 As your Top Rated Local® spa in Staten Island, we have some tips for you to scare off those cold weather blues. As the colder weather sets in, it’s easy to want to stay in the warmth of your home, shut away from the cold outside world. We get it. There’s nothing like cozying up on your couch with a fluffy blanket, a hot cup of tea, and the latest Sandra Bullock flick. But the truth is, getting outdoors, even on those brisk New York days, is good for your health and wellness. It gives you a chance to breathe in the fresh air, get some sun, and get a little exercise. Plus, if you’re normally a social butterfly, shutting yourself inside for fall and winter will really bring down your mood. The drab, dreary fall days can make your home a dark space. While a dark, dimly-lit home can be quite relaxing and comfortable, your body will eventually long for daylight. Add a little extra light to your home by replacing old light bulbs, opening your drapes and blinds, and spending more time near windows when you’re lounging around the house. Place fresh flowers on your dining table to remind you of the warmth and radiance of summer. Doing these things can lift your mood and may even boost your energy. Many tend to fall out of their normal exercise routine when the colder weather settles in. Do your best to maintain your workout routine, even if that means taking a brisk 20-minute walk every few days, or dancing in your apartment to your favorite Lady Gaga track. The important thing is to stay active to get your heart rate going, which releases endorphins that can boost your mood and energy. Oftentimes, doing something nice for someone else can give lift your spirits when you’re feeling down. Get out and make a difference in your community this fall by volunteering at a local shelter or animal rescue. Even buying coffee for the person behind you in line will give you the warm fuzzies you need on a chilly fall day. Not only will you shake off your cold weather blues, you’’’ brighten someone else’s day. Treating yourself to a day at the spa is always a great way to scare off those fall blues. But you don’t want to just go to the first that pulls up when search “spa Staten Island.” You want to go to a spa that is warm, welcoming, where you know you’ll be pampered with all the best spa treatments. At Remedi Spa, we’re a Top Rated Local® spa in Staten Island for a reason, and our client reviews will attest to that. We would love to melt your cold weather blues away, so visit our site to schedule an appointment online, or call us at (718) 605-7900 to book your appointment for a massage, facial, body wrap, laser hair removal, and so much more! Thank you for reading our post, and we look forward to seeing you!